As the NCAA basketball season inches towards tournament time, allow me to highlight my favorite place on the planet to watch college hoops. As Philadelphia’s most revered sports venue, the Palestra is appropriately called the Cathedral of College Basketball. Recognized as the birthplace of college basketball, this hallowed arena opened its doors on the University of Pennsylvania campus on January 1, 1927. On that seminal day, Ivy League rivals Penn and Yale tipped off in what would become the first of thousands of games held in this building. Named after an ancient Greek rectangular enclosure, the sparkling new facility was designed to house 8,722 spectators. However, more than 10,000 excited fans crammed into the Palestra to witness Penn beat Yale 26 – 15 on its opening day. 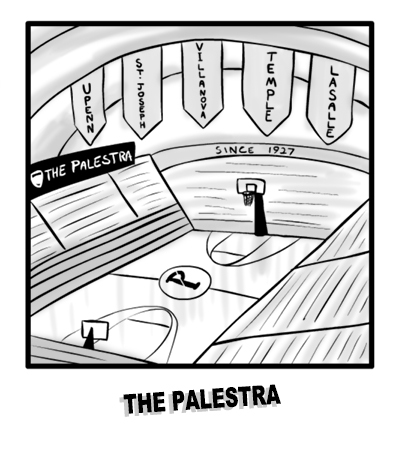 Since then, the Palestra has hosted more NCAA college basketball games than any other arena in the country.